Lauren doesn't want to face the diagnosis; she fears the news that her mother's cancer has returned. Without planning or even conscious intent, she sets off driving, trying to escape her troubles. Three hundred miles later, Lauren is lost in the desert, surrounded by a dust storm. Finally, she escapes the storm and finds a town where she hopes to get gas, a phone to call her mother, and a hotel room for the night. What she finds instead is a town strangely cluttered with trash, and populated by residents who seem troubled. This is the town of Lost, where everything that is lost - including people - ends up. There's no escape from Lost unless you find what you've lost. With the help of a precocious child named Claire and a mysterious, charismatic man named Peter who calls himself the Finder, Lauren tries to find a way to get out of Lost and back to her mother. 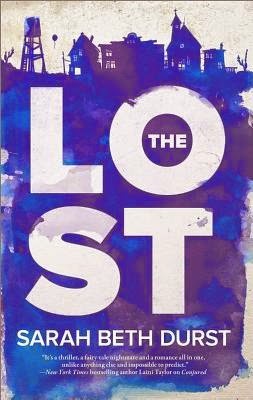 The Lost is Durst's first foray into adult fiction, and what an adult debut it is! As with her YA's, she doesn't disappoint. An intriguing and twilight-zoneish premise, fascinating characters, and a highly readable story make this a book you won't want to miss. I don't think that Durst gets the recognition she deserves for being one of the best writers of literary fantasy today. I've followed her books since her first one, Into the Wild, which I loved, but over the years since then she's honed her craft to a exceptional level. Her literary technique is masterful, yet doesn't get in the way of telling a good story. The Lost is a very character-driven story. Although there are a few edge-of-your-seat moments, the plot is primarily driven by Lauren's character arc. It's a mesmerizing book that's hard to put down, and one that proves a book doesn't have to be driven by a frenetic plot to be a page-turner. As you can imagine from the title, everyone in the town of Lost is, well, lost in some way, and the book revolves around a theme of finding your way. Even the Finder, who is supposedly there to help people, seems, in some ways, more lost than anyone. Lauren's journey of self-discovery unspools gradually, as her relationships with Claire and Peter develop and the details of her past life are teased out. The town itself is fascinating and well developed, almost a character in itself. The streets are cluttered with piles of things that were lost: keys, socks, luggage, and even things like foreclosed houses scattered all over, creating an odd juxtaposition of different architecture. It's all a little bit creepy, as well, in a Stephen King kind of way. The idea sounds like a cliche, but it's so much more than that and the reality and details of life in Lost are fully fleshed out. Survival is a big part of life in Lost; residents have to scavenge among the piles to find the necessities of life. And not everyone in Lost is friendly, in fact, some are decidedly unfriendly. So Lauren has to learn how to survive in Lost as well as trying to figure out how to get home. I hope I won't be spoiling too much if I say that there's a powerful chemistry between Lauren and Peter right from the start, but I won't say much more than that. It's handled well, and while it's an important element, it doesn't take over the story. None of the three main characters appear to be people of color in this book. One of the important secondary characters, Victoria, who runs the diner, is described as having rich brown skin. In conversation with Durst, she confirmed that Victoria is African-American. She also told me that Peter is half Native American, but the reader doesn't learn this explicitly until book 3. Any relationships in the book were heterosexual, and all characters appear to be cisgender. Since Lost draws in all sorts of lost people, one could reasonably expect to see a diversity in Lost reflective of society in general, however, I didn't see that. There's quite a variety of people in Lost, but other than the one character, none were described in a way (that I noticed) that would lead me to believe they were from an underrepresented group. Adult and teens who like a well-written, slightly dark, character-driven fantasy with an intriguing premise and a bit of a romantic interest. Although The Lost was published for the adult market and has an adult protagonist, I think it has a strong teen crossover appeal. For another view of The Lost, check out Reading in Tandem: "The Lost," by Sarah Beth Durst at Finding Wonderland. FTC required disclosure: Review copy sent by the publisher to enable me to write this review. The bookstore links above are affiliate links, and I earn a very small percentage of any sales made through the links. Neither of these things influenced my review.